"There's no such thing as a free lunch," according to Nobel Prize economist Milton Friedman. He obviously wasn't talking about solar energy! 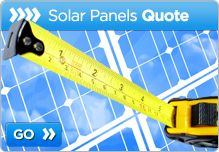 The term solar energy encompasses several distinct technologies. All convert sunlight into usable energy, but the energy isn't always in the form of electricity. For example, solar hot water heaters are used to provide hot or pre-heated water. In some cases, solar hot water provides 100 percent of the hot water demand, but in most cases it is used in conjunction with a conventional hot water tank to reduce costs associated with the hot water supply. Concentrating solar power systems are used industrially to superheat salt-gradient solar ponds or other thermal transfer fluids. The technology relies on parabolic mirrors, Scheffler reflectors, lenses or other concentrating devices to focus sunlight into incredibly powerful beams that can reach temperatures well above 300 degrees Celsius. Solar heat is sometimes used to convert water to steam, which is then used to drive a conventional steam generator to produce electricity, and many conventional power facilities are incorporating solar heat technologies into their production portfolios. Solar daylight systems collect and distribute sunlight for interior lighting. Solar daylighting is a passive technology that introduces sunlight through highly reflective tubes, or simply through strategically placed windows, to eliminate the need for artificial lighting sources. 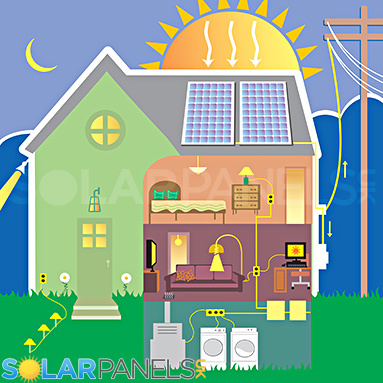 The technology that is most commonly thought of as solar energy is more properly called solar photovoltaic energy. Solar photovoltaic energy, often abbreviated as PV, users solar panels to convert sunlight directly to electricity. The electricity may be used as it is produced, it may be stored in batteries for later use, or it may be sent into the electrical grid. In a scheme known as a Feed-in Tariff, energy companies in the UK are required to buy unused electricity from customers who generate electricity from PV solar panels and wind turbines. 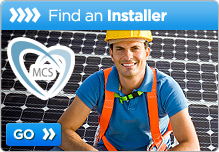 How Do PV Solar Power Systems Work? Photovoltaic cells are solid state devices that convert sunlight into electricity on an atomic scale through a process known as the photovoltaic effect. Certain chemical elements are known to absorb photons and release electrons in return. Electrical current is simply the flow of electrons. Although most people think of Thomas Edison as the greatest inventor of the electrical age, Albert Einstein won a Nobel Prize in physics for explaining the photovoltaic effect. To understand how solar cells and solar panels work, it is necessary to understand just a bit of physical chemistry relating to crystalline solids known as semiconductors. Some elements hold all of their electrons in an energy band known as the valence band. Electricity cannot pass through these elements, because the electrons are all tightly held in place. Without the movement of electrons, there can be no flow of current. These materials are used as insulators. Metals, on the other hand, have many of their electrons in what is known as the conduction band. These electrons are able to move about freely, and that is why metals conduct electricity so well. Semiconductors fall somewhere in between insulators and conductors. When energy is applied to a semiconductor, some of the valence electrons move into the conduction band. They move through the crystal lattice and leave an atomic hole behind in their previous position. Valence electrons from surrounding atoms are pulled into this hole, creating new holes behind them. When the process occurs in one direction only, it creates a flow of electrons, which is an electrical current. Solar cells can be made from many different semiconductor materials, but they are most commonly made from thin wafers of silicon. When sunlight strikes the surface of the silicon, some of the photons are absorbed. These photons transfer energy to valence band electrons, the energized electrons move, and the electrical current is started. The silicon wafers in solar cells are doped with other material to create unidirectional electron movement through the wafer. A single solar cell will not produce much electricity. To generate significant voltages, they are connected in parallel sets in a large panel known as a PV solar panel. The number of cells in the panel determines how much energy it will generate. Multiple solar panels are connected to create a PV power system. PV panels do not require direct sunlight to create electricity. Even on cloudy days, small amounts of electricity are produced. Are There Problems With Solar Power? There are three issues with PV solar panels, but they are not significant enough to reverse the ultimate economy of the systems. The first issue is that PV solar panels are fragile. This is not a problem when they are mounted on a roof, but care must be taken in the installation process. The second problem is that they are temperature sensitive. When they become hot, they become less efficient. Sunlight obviously heats them up, but the additional sunlight produces enough current that the drop in efficiency is not noticed. It is an important consideration, however, because hot, sunny days do not produce proportionately greater amounts of energy. New technology has been developed that may significantly improve PV panel efficiency. Instead of placing panels on rooftops, researchers have developed much smaller cells that can be paced along the edge of window glass. As sunlight passes through the window, portions of it refract along the plane of the glass. This sends photons to the PV cells without a corresponding transmission of heat. 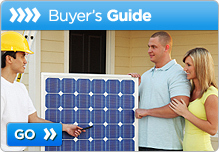 The final issue, and the most important issue for most consumers, is the cost of PV solar panels. Although production costs are decreasing as technology improves, the initial cost of PV solar energy is significant. The costs are certainly recovered over the life of the system, but many homeowners are reluctant to pay the initial costs and wait 10 years or more for a return on the investment. 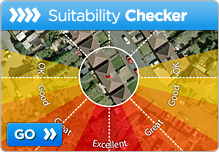 The government has created the Feed-in Tariff scheme to give homeowners an incentive to make the initial investment. Revenue generated from selling excess electricity back to utility companies helps shorten the payback period for the systems. 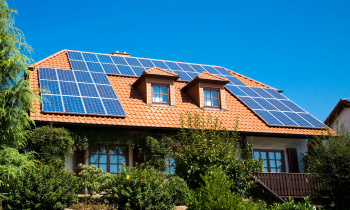 Another benefit of increased residential PV solar energy usage is a reduction in demand from the conventional power grid and less pollutant emissions from mainstream power generators. Economists may be correct in asserting that there is no such thing as a free lunch, but PV solar energy certainly picks up its own cheque over time.